Do you ever have one of those ah-ha moments when working in the kitchen? I certainly did recently when I finally decided to try making homemade granola. 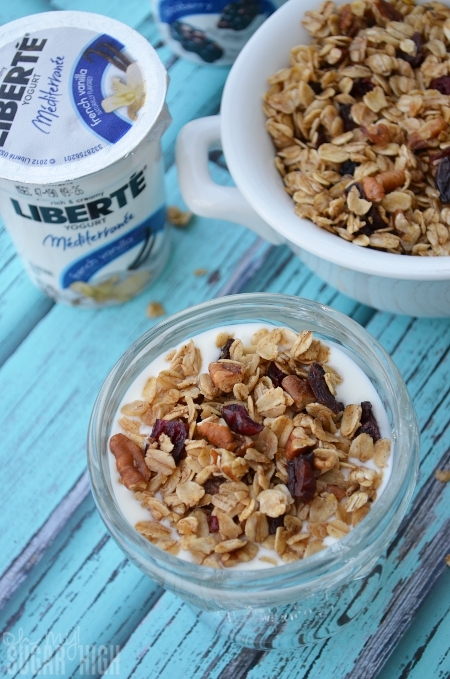 I must thank Liberté for asking me to make a recipe that would pair well with their yogurt which prompted this in the first place. 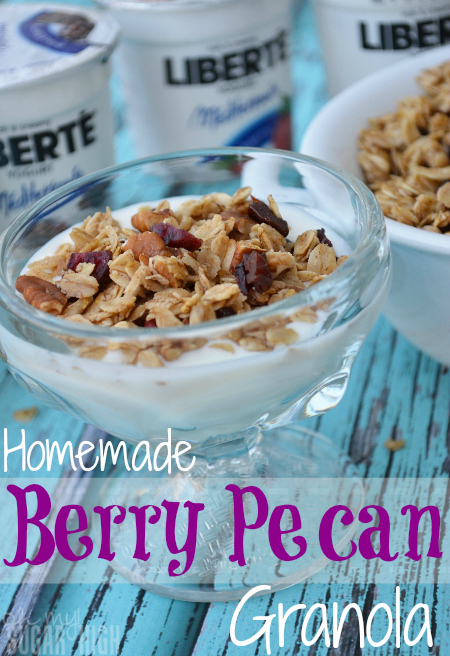 I had no idea how easy and fun it could be to come up with a granola recipe. And I feel a little silly for not having tried it sooner. It was so fast and the taste? I think I’m ruined from buying store bought granola for life. And so is my family. While this recipe should easily be stored in an airtight container for two weeks, I wouldn’t really know as it lasted more like two days. We were all, my kids included, eating this stuff like it was candy. I’ve already been asked to make some more. Can you blame them? 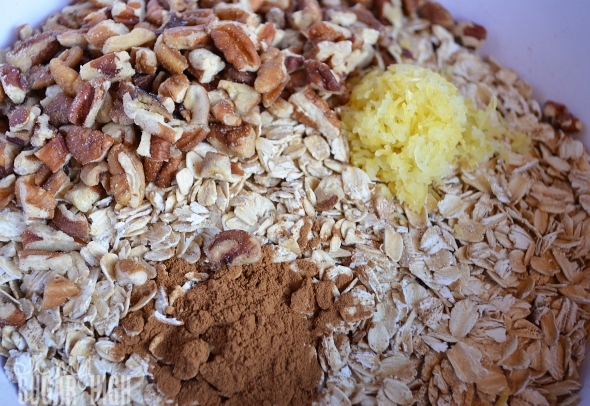 In a large bowl mix oats, pecans, lemon zest, cinnamon and salt together. Set aside. 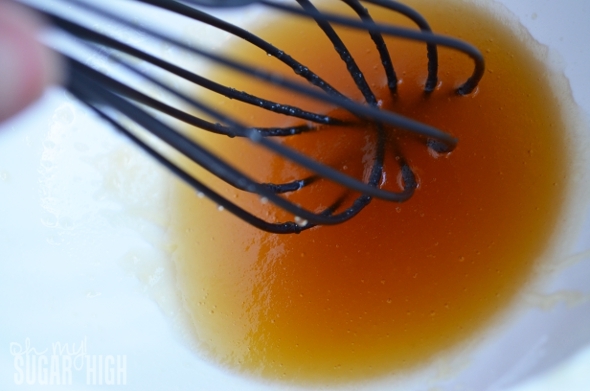 In medium bowl whisk coconut oil, honey, maple syrup and vanilla until combined. 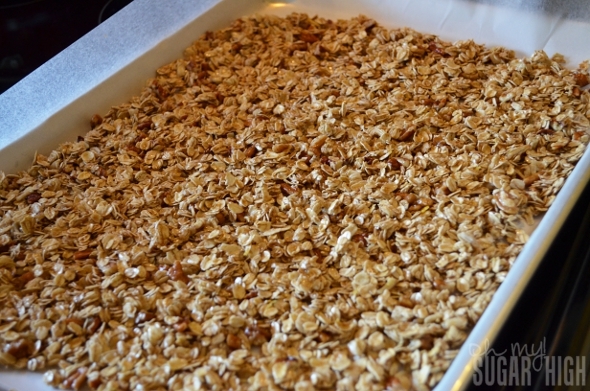 Bake for 15 minutes, stopping halfway through to stir granola and flatten again for even cooking. Once removed from oven, immediately place granola in a bowl. Toss in chopped dried berries. Cool before serving. 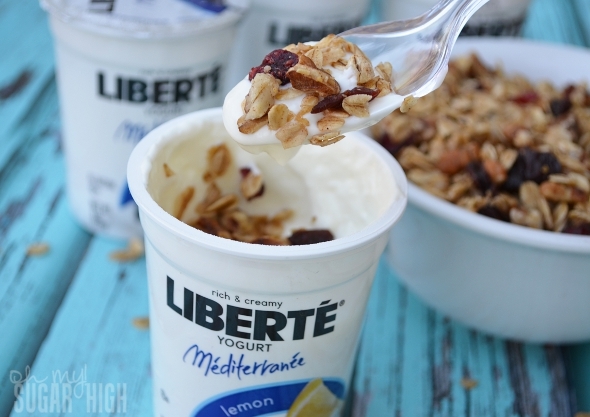 Play around with different flavor combinations of yogurt and granola. You can use virtually any kind of dried fruit or nut combo that grabs you. Have fun with it! Doesn’t this granola look delicious? And what is better served with granola than yogurt? It is definitely a perfect pairing. 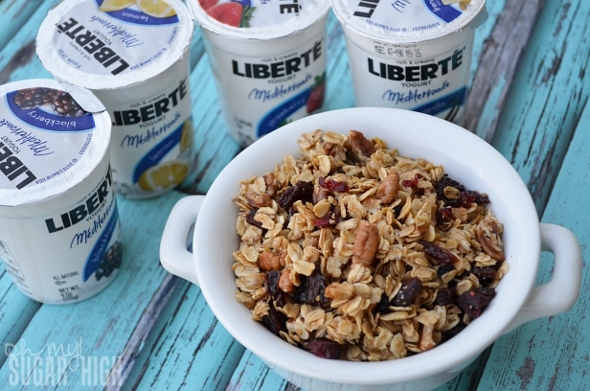 I had Liberté Méditerranée yogurt in several flavor varieties including french vanilla, strawberry, lemon and blackberry. (My local store is finally carrying more varieties in stock!) 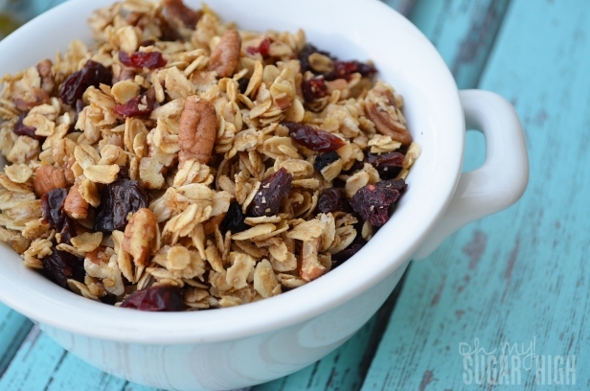 All flavors worked well with this granola. The lemon zest really adds a special sweetness to the granola. And because this yogurt is thicker and more dessert like, it make this more like a dessert. A dessert you can totally get away with eating in the morning without all the guilt. So serve it right out of the yogurt cup or go fancy and add it to a serving dish. Either way, you’ll be enjoying an amazing combination. Disclosure: This is a sponsored post. All thoughts remain my own. This is very similar to a recipe I make… I add 1 cup of shredded coconut, use almonds instead of pecans, raisins instead of mixed berries, omit the cinnamon and lemon zest, and use olive oil instead of coconut oil. 🙂 Absolutely delicious!